One thing that I believe strongly is that everyone we encounter in life has the capability to teach us something, be it in the form of a small nugget of wisdom or by offering up an experience that opens our eyes to new ways of seeing and being. I was blessed enough to have spent a Tuesday afternoon the other week with a wonderful, gifted woman who was kind enough to offer me the latter of the two. This talented, wild soul is photographer Laurie Dirkx who makes the trek from her home near Rochester, New York to Benezette every fall to spend some time transforming our wildlife, some large and some small, into stunning artwork. Raised in a conservationist environment, Laurie was taught to respect wildlife and their habitat; during photo shoots she will ensure that a minimum amount of disturbance occurs while she is capturing her subject. Following a 31-year long, yet unrelated career, Laurie picked up her camera and never looked back. In her words, the outdoors is not a a destination for her, it is where she comes home. This art is her medicine and is a testimony to the kind of therapy one can find in nature. Her reverence for, and solace she finds in, the natural world radiate from her photos and one cannot help but be drawn in by the aesthetic. As nascent photography enthusiast, I like to feel that my mind’s eye is spot-on but my technical skills don’t always allow my vision to come to fruition, let alone allow my photos to do things like ‘radiate’ or serve as a testimony to much. Despite my admitted reluctance and/or borderline fear, I was ecstatic that Laurie agreed to take me out for an afternoon and I was very much looking forward to spending some time tailing her throughout Elk Country as she stalked her next subject to shoot. What I did not expect was how patient she was with me and my unrefined skills behind the lens of a camera, as she showed me the finer points of composition, lighting and yes, even how to operate my own camera. When it comes to subject selection, Laurie is not one to shy away from those that others might find unappealing or fright ening, she believes firmly in the impact that education can have when confronting creatures that one is unfamiliar with or finds discomfort around. She has done extensive shoots of rattlesnakes around the Benezette area, for example, and is not only an expert when it comes to aperture and other photography fundamentals, but also is extremely knowledgeable about their biology and habitat. 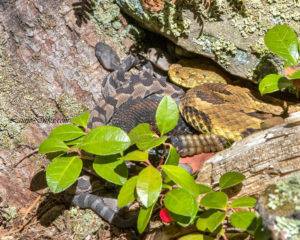 The photo to the right includes the Timber Rattlesnake (Crotalus horridus) with neonates (4-day old young) and the red berry is the American Wintergreen (Gaultheria procumbens); I sincerely appreciate all of Laurie’s expertise for this post! Despite Laurie’s impassioned speech about rattlesnakes, I was glad that she was able to photograph her slithering friends with Hicks Run Outfitters the previous day, leaving us in search of other subjects that weren’t quite so venomous. 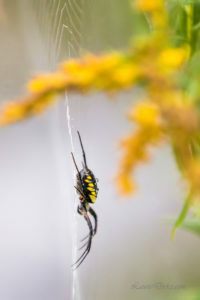 Our first stop was below the Winslow Hill Elk Viewing Area, where I can honestly say that I would have strolled right past Laurie’s first subject without even taking notice: the Black and Yellow Spider (Argiope aurantia), pictured left. 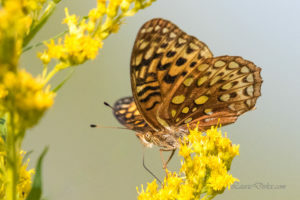 We later drove up to the Woodring Farm Trail where we encountered other subjects such as the Great Spangled Fritillary (Speyeria cybele), pictured right, and other wonderfully-winged visitors taking advantage of Goldenrod in full bloom. 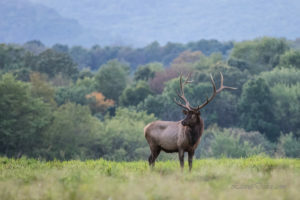 In an environment that is in a full-on, species-specific frenzy during the fall, these unassuming and silent subjects were the perfect antithesis to the typical photographic focus of Benezette in autumn: elk in rut. During the months of September and October the Benezette area is flooded with tourists in search of one particular experience… to hear the elk bugle. Now if you have never heard an elk bugle, it is by far one of the most eerie noises you will likely have fall upon your ears. If you can picture yourself in the early morning fog, before daybreak, watching out into a field and scanning the distant wood line for the sight of a large bull, then you hear it… a bellow, escalating to an other-worldly, shrill squeal (see the RMEF page for some good audio clips!) that I guarantee you are not likely to forget, as it is like nothing you have ever heard (though a post on the National Geopgraphic blog likened the sound to demons from Lord of the Rings, so maybe some LOR fans already know what I am talking about). 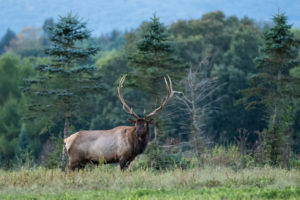 Though elk can be seen year round, during rut (the reason for the bugling) they are very active, with the bulls pursuing cows and not hesitating to spar with other potential suitors of their harem. This activity makes it a prime time for photographers to travel to the area to try and get a snapshot of the mating madness. I followed Laurie (by motorized vehicle, thankfu lly) up Winslow Hill to the Elk Country Visitor’s Center where we… waited, and waited some more (patience is not my strongest attribute). Finally, we heard a bugle coming from below the crest of the hill. I have to say that people are far more polite to individuals with very large camera lenses it seems, allowing Laurie to move along the stone wall so that she could find the angle that she wanted and to avoid the nearby trees… I, thankfully, was able to ride her proverbial coattails and ready myself for the approaching bull, heard but not yet seen. When he finally crested the hill, I was immensely grateful that I had toughed out the evening instead of racing straight back home to do paperwork like I normally would after a day of welcoming new tenants to our rentals. Though I need about another decade of dedicated practice to even snap a photo that resembles any of those that belong to my photographic guru, I am happy with the results of our time together, in the form of photograph, but mostly in the form of an unforgettable experience that has opened my eyes and my spirit up a little bit more to my own wild side. Thank you, for such kindnesses – it is me who’s been greatly enriched from having spent time with you, Jennifer. You’ve amazing talents, and are a most treasured friend. I am proud to say that Laurie is my sister and her work and photography is amazing. This was wonderful.